Well, another month has gone by, and that means we can turn our attention to the Pending Home Sales Index published by the National Association of REALTORS® (NAR). If you have followed any of my previous articles about Lawrence Yun and the questionable housing reports coming from NAR, then you won't be disappointed with today's no-spin summary of the Pending Home Sales Index. The Pending Home Sales Index,* a forward-looking indicator based on contract signings, declined 5.5 percent to 95.5 from a downwardly revised 101.1 in March but is 14.4 percent above April 2011 when it was 83.5. As a reminder, NAR came out earlier this year and softly reported that all the sales numbers that they reported in the past were wrongfully inflated, so they "revised" past years' data downward. And of course, NAR immediately reported three "up" months in a row. But if you read the above quote from NAR closely, you will see they omitted one "downwardly revised" reference. It should read "...declined 5.5 percent to 95.5 from a downwardly revised 101.1 in March but is 14.4 percent above a downwardly revised April 2011 when it was 83.5." Now, if that has you all discombobulated, then you are like the rest of us who have no idea what NAR is really reporting (and then revising). At the end of the day, I believe they just want us to read that "all is good and getting better." My reporting on the Pending Home Sales Index in Tallahassee is very simple. I do not estimate any numbers, thus I do not require a revision process. This first real estate graph shows the average number of contracts every day, going back to the end of 2008. If somebody can show me a housing market recovery in this graph, I would greatly appreciate it. The Tallahassee Pending Home Sales Index has posted four consecutive months of gains over the same months in 2011. THIS IS GOOD NEWS. The yellow bars in the real estate graph above show a small gain year-to-date versus new contracts through May of 2011. But the gains need to be much larger. 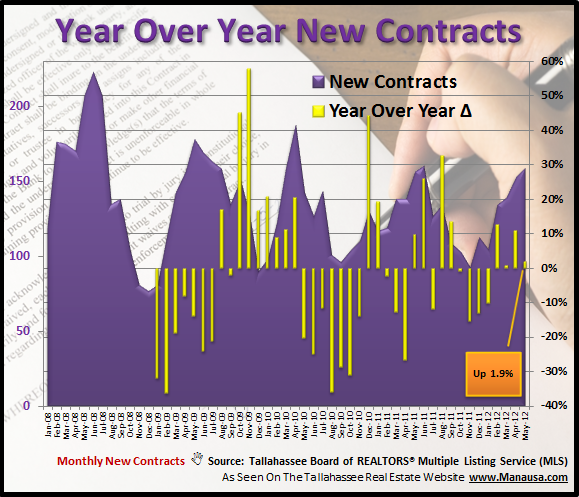 New contracts are still running near an all-time low, and we need them to more than double to get back to a "normal" level of home sales in Tallahassee. More than 1/3rd of our historical buyer pool is trapped in homes which have loan amounts far greater than the value of the homes. We know they want to move (see my article on the Forgotten Real Estate Inventory), but they cannot sell and have the equity required to buy back into the market. 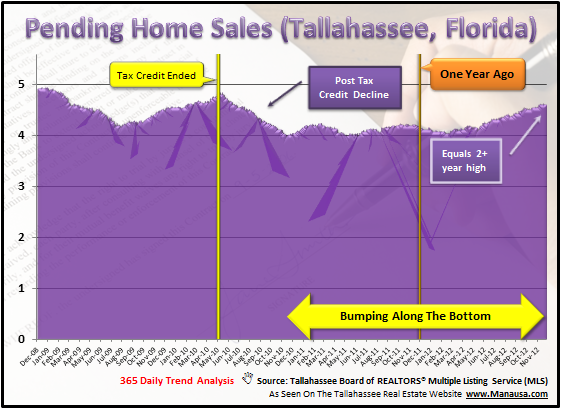 The Pending Home Sales Index in Tallahassee will continue to run short of historical norms until we are able to solve this problem. 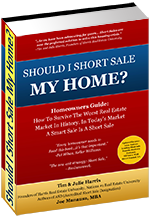 I encourage homeowners to read our free e-book titled "Should I Short Sale My Home," as it contains a lot of good information that is being used by people who are successfully moving on with their lives. Please come back again at the end of every month, and I will contrast (or compare) our Pending Home Sales Index with NAR's accounting of new contracts nationwide.